Zig Ziglar lived a difficult life. Born in 1926, he was the 10th of 12 children. His father died when he was 6 years old, leaving his mother to raise him and his siblings alone during the worst depression the world had ever seen. Zig’s mother did not have much of a formal education but what she lacked in training she made up for with a hard work ethic and strong morals which she taught to her children. Born from these humble beginnings, Zig became a global leaders in the realm of positive thinking and self improvement. 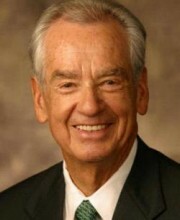 Zig Ziglar wrote See You at the Top as his own how-to guide on living a life of happiness, health and wealth. The book is cleverly written with many great stories to illustrate his points. Throughout the book, Zig uses the imagery of a flight of stairs next to an elevator that is ‘out of order’. The idea is that while each step gets you closer to the ultimate goal of a happy purposeful life, the steps must be taken in order and there are no shortcuts (as the elevator is ‘out of order’, you have to take the stairs). Zig’s 6 steps to success and happiness are Self Image, Relationships with others, Goals, Attitude, Work and Desire. Zig is a perfect writer for those of us with short attention spans as each point he makes is backed up by a cute story which is never more than a page or two. Some of the stories Zig uses are ‘over the top’ which is probably why the book is such an entertaining and memorable read. "…a goal casually set and lightly taken is freely abandoned at the first obstacle." Make no mistake about it, goal setting requires concentration and is serious work. Setting arbitrary goals with no real deadlines or objectives (i.e., I want to lose weight) rarely if ever become reality. Zig says goals should always, 1) take into consideration your current reality, 2) identify current roadblocks, 3) be big enough to create excitement, 4) be long range to avoid being caught up by minor setbacks, 5) be broken down into daily actionable increments and 6) must be specific and measurable. To start, write down on a piece of paper everything you want to be or do or have. Take an uninterrupted hour to do this and really empty your head of all your aspirations. When you’re done put the goals away for two days then come back to them and write one line to describe why you want to achieve each goal. Your goals should cover all areas of your life, including financial, physical, social, career, family and spiritual. Setting just one or two goals will work but Zig says you will not be happy unless you are striving to achieve in each category because your life will not be balanced. Most people are very busy getting nothing done. It’s easy to get caught up in the business of life so it’s very important to break the goals down into daily tasks. If you want to “make it big” you must work towards your objectives on a daily basis. By doing small things every day to work towards your goal, you will be amazed at the progress you will see in a short period of time. "You don't drown by falling into water, you only drown if you stay there." Many times along your path you will have interruptions, it’s inevitable, and life frequently gets in the way. This imagery is very powerful. So often we get down because of minor setbacks. If we were to give up at every roadblock we wouldn’t get very far. There is an interesting story that Zig uses in the book about this. Imagine a pilot is flying from New York to Los Angeles. After the plane takes off for LA it encounters a major thunderstorm which was not on the radar before takeoff. Will the pilot give up and turn back to New York? Of course not! The pilot will adapt, adjust the path accordingly and move on towards the target. In the same way when obstacles appear a simple change of direction may be needed but not an abandonment of the larger goal. Usually the problems that arise are quite minor. Take a step back, look at the new situation that has arisen and change your plan accordingly. As mentioned above, by making the goals long term it’s easier for you to side-step these small obstacles when they arise. While properly setting goals is only one step in the overall Zig success formula, I believe it is the most important one. Many people will tell that they know it is a good idea to set goals, but only 3% of us actually properly set and execute them. It’s like that with many of the lessons in Zig’s book. Most of them are ‘common sense’ but rarely acted upon. In a world where instant gratification is the norm, See You at the Top is a refreshing look at the realities of becoming a successful individual. It is a must read as a refresher for those who are deep into personal development or as a solid base for those who are starting their paths to health, wealth and happiness.